An intriguing and mystifying book by Diane Setterfield – Once Upon a River – without doubt one of the best books I read last year – I was entranced from the beginning to the end. It’s a mystery beginning in the Swan Inn at Radcot, an ancient inn, well-known for its storytelling, on the banks of the Thames. A badly injured stranger enters carrying the drowned corpse of a little girl. It’s mystifying as hours later the dead child, miraculously it seems, takes a breath, and returns to life. The mystery is enhanced by folklore, by science that appears to be magic, and by romance and superstition. The story has a timeless feel to it but it is set somewhere towards the end of the nineteenth century. There are numerous strands and characters to the story and Diane Setterfield drew me slowly into the book with a leisurely description of the characters and their situations. Just as the river, a character in its own right, takes many twists and turns and has many tributaries, it becomes apparent that the little girl could belong to a number of different families all with links to the river. As the story progresses these individual families each claim the child as theirs and I was never really certain which of them – if any – were telling the truth. Much is hidden and much eventually is revealed. 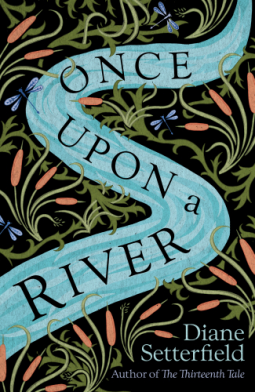 Once Upon a River is a beautifully and lyrically told story, and cleverly plotted so that I was not completely sure at times what it was that I was reading. It’s historical fiction with a touch of magic that completely beguiled me with its mysteries and fascinating characters. I enjoyed reading her first book, The Thirteenth Tale, years ago before I began my blog, but I loved this one so much more! My thanks to the publishers, Transworld Digital, for my review copy via NetGalley. I was one of the few people I knew (possibly the only person I knew) who really couldn’t see what all the fuss was about when The Thirteenth Tale was published. Consequently I didn’t bother with Bellman and Black and didn’t request this one when it was offered on NetGalley. However, Bellman and Black is the February read for one of my book groups so if I enjoy that better than The Thirteenth Tale then I may reconsider. Whilst I remember enjoying The Thirteenth Tale and thinking it began really well, I felt the ending wasn’t as good and that it didn’t live up to the hype. I’ve never tried Bellman and Black so I’m wondering now if I should as Once Upon River is so different from what I remember of The Thirteenth Tale. Yes, it was the ending that I found so disappointing as well. In that case, maybe I should give this new one a try. Maybe see if the library has a copy – my library has a copy of The good man Jesus and the scoundrel Christ, so I’ve reserved it as you suggested to see what it’s like. This does sound intriguing, Margaret. I know what you mean about a book having all sorts of layers, and needing time to digest. The mystery sounds engaging, too, and I’m glad you enjoyed it. Looking forward to reading this. I wasn’t that fussed about The Thirteenth Tale although it was not by any means a bad book. But this I fancy I might like a lot more with its Thames setting. I’ve heard so many glowing things about this book – maybe one I can get my book group to read sometime! Glad to hear you enjoyed this so much, Margaret! Your review has made me want to pick up my new copy ASAP!